Any doubts the public has about the seriousness of video game addiction should be put to rest. The landscape of gaming has evolved enormously over the decades, but alarm bells have been ringing for almost as long. After the release of a new version of the infamous MMORPG (massively multiplayer online role-playing game), this 15-year-old collapsed and went into convulsions caused by sleep deprivation, lack of food, and the prolonged period of concentration playing the game. In Canada, the disappearance and death of a 15-year-old Ontario boy after a dispute with his parents over a video game revived concerns about computer games, and connected internet gaming in particular. Elsewhere, a Philadelphia resident and obsessive gamer, Tyrone Spellman killed his 17-month-old daughter after she damaged his Xbox game console. Indeed, in 2018, two young men lured an ex-roommate to their home and fatally stabbed him over a stolen console. A year earlier, Brian Vigneault died after attempting to stream a 24-hour marathon gaming session on Twitch. What do all of these tragic events have in common? The portraits depicted are primarily male and many show signs of video game addiction. Coincidence? Probably not, according to research from Stanford University. The brain-imaging study by researchers at Stanford’s school of medicine suggests that while playing video games, men have more activity in the mesocorticolimbic center, the region of the brain associated with reward and addiction, than women. Study participants – 11 men and 11 women – were asked to click on 10 moving balls before they hit a wall on the screen. Successful players were rewarded with territory, though the participants were not told the benefits of clicking on the balls. All participants quickly figured out the objective of the game and displayed similar motor skills, but because the men figured out which balls (the ones closest to the wall) earned them the most land, they gained significantly more territory than the women. The researchers also found greater activation in male brains in three brain structures – the nucleus accumbens, amygdala, and orbitofrontal cortex – and that the brain activity increased according to how much territory they had gained. The female brains showed no such correlation. 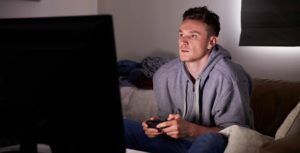 Researchers believe these findings, which were published in the Journal of Psychiatric Research, can help explain why most avid video gamers have a Y chromosome. “These gender differences in the brain may help explain why males are more attracted to, and more likely to become hooked on video games than females,” said Dr Allan Reiss, who headed up the research team. Of course, many women enjoy video games and play exceedingly well. But by triggering the reward centers of the brain, there is concern that men are at higher risk for video game addiction or compulsive gaming. A male 30 years of age or younger who spends about seven or eight hours a week gaming – this is the description industry experts provide of the average gamer. Console gaming became an entertainment staple for the millennial generation and many have carried their love of video games into adulthood. Behind them is a younger cohort of players also firmly rooted in gaming. Over the coming decades, gaming is likely to shift from merely a hobby of teens and children to an activity enjoyed by young and old alike. At least 90% of American youth play video games and as many as 9% of them (more than 3 million individuals) may be addicted, according to data cited in a report by the American Medical Association’s Council on Science and Public Health. A recent Harris Interactive study reports that the number is even higher, with nearly one-third (31%) of males and roughly one in ten females (13%) reporting that they have felt “addicted” to video games. The AMA also warns that dependence-like symptoms including academic underachievement, aggression, and weight gain are more likely in children who start playing video games at younger ages. For both men and women, gaming can yield many of the characteristic signs of addiction: a sense of euphoria; excessive gameplay and thoughts about gaming; neglecting family, friends, and school or work; and even physical symptoms such as migraines, weight gain, and sleep disturbances. Young people who are isolated, anxious, depressed, or suffering from low self-esteem are particularly at risk of developing a video game addiction. In light of the recent news stories about young people engaging in compulsive gaming to the detriment of their health and the safety and well-being of those around them, some companies are responding by changing how they design their games. Blizzard Entertainment, the creator of the online game World of Warcraft, updated its game to minimize the qualities that might provoke dependency in its players. Video game manufacturers are also focusing tremendous resources on developing games with active and social components, such as Guitar Hero and Wii Fit. Experts recommend that parents set limits around the number of hours or minutes kids can spend playing video games each day. Even if teens don’t always follow the rules, research shows having a rule in place helps children understand what is expected of them. As with all products with potential for abuse, moderation is the most important rule of thumb. If you believe your child may be addicted to video games, internet gaming, or computer games, there are programs that can help your son or daughter acknowledge the problem and find healthier ways to have fun. Wilderness therapy programs are an excellent option to remove the adolescent from their tech surroundings, reinvigorate their passion for other activities, and reintroduce them to healthy social interactions. Therapeutic boarding schools can also be life-changing for teens struggling with video game addiction, behavioral problems, or learning differences. Young people, just like adults, need healthy distractions and outlets for stress relief. Video games can certainly be one item on the list of fun things to do after a long day at school or work. But other items on the list, including playing on a sports team, joining a club, walking the dog, reading a book, and others, should also be pursued regularly. Although boys are sometimes drawn to video games like a moth to the flame, they also have dozens of other interests and talents that deserve to be explored.